I recently received this press release from Black Widow Records – the Genoa-based label whose roster includes a number of historic Italian progressive rock acts, as well as many newer ones – which I am glad to share with my readers, especially the many fans of Italian prog. On Friday, April 8, 2011, Delirium, one of the seminal bands of the original Rock Progressivo Italiano movement, will be performing at Genova’s Teatro Govi. 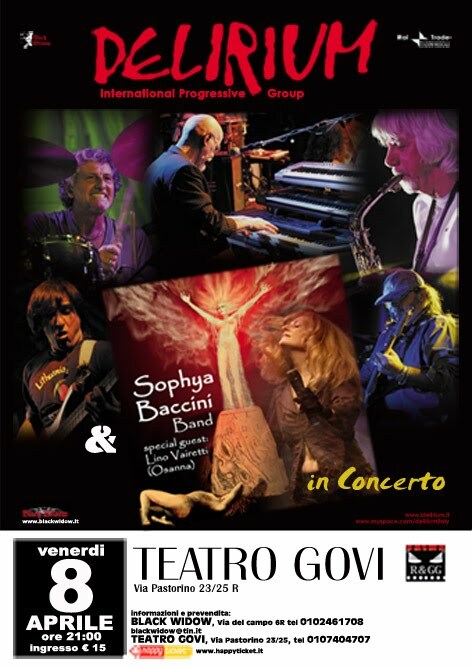 The concert will be opened by gifted Neapolitan singer Sophya Baccini (whose excellent solo debut, Aradia, was released in 2009), with legendary Osanna vocalist Lino Vairetti as a special guest. In the course of the evening, Delirium will present their new DVD, Il Viaggio Continua: La Storia 1970-2010 (recently released by Black Widow), which features original live footage from the Seventies, plus a recording of the band’s concert at the Teatro Politeama (also in Genoa) in 2008. Their setlist will include material from both their ’70s albums and their critically acclaimed 2009 CD Il Nome del Vento – as well as semi-acoustic arrangements of some of their best-known songs. Though I am aware that for most of my readers it will not be possible to attend this event, if any of you happen to be in the area, this is definitely an opportunity not to be missed. In the next couple of weeks Genoa will host a number of events that will further strengthen its status as a hotbed for great progressive rock. The concert will start at 9 p.m. Tickets are € 15. Teatro Govi – Via P. Pastorino 23-25 R – Genoa, Italy. Maybe a new DVD or maybe some excerpts to be shown in YouTube or other similar sites. Events like that never go blanked.